Tonight’s recipe (hm, we’ve been doing a lot of squash soups lately…) is from Veganomicon: The Ultimate Vegan Cookbook . 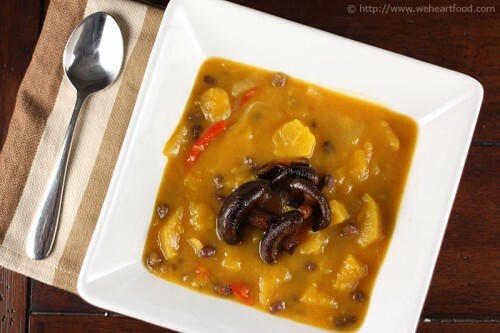 Squash, pears, onions, and peppers are cooked until tender and then partly pureed; adzuki beans are stirred in, and then it’s all topped with some sauteed shiitake mushrooms. This soup reminds me that I want an immersion blender. This transferring half the soup to the blender thing is for suckas! Guess you’re a sucka then… looks good! Like butternut squash soup. Acorn, but close enough. I like it; it’s got a nice sweetness from the pears. Oh yeah, I forgot that you don’t like sweet things for dinner. And this isn’t even that sweet, really. I know… it’s good, but I like savory. Well I really like it — and the mushrooms are awesome. That’s totally true — I’d actually put more in and make it part of the soup. Sounds like you’re trying to recreate the soup we made last week. Oooh, yeah! I liked that one a lot. Preheat a large dutch oven over medium heat. Add the oil and sauté the onions and peppers for about 10 minutes, or until onions just begin to brown. Add the ginger and garlic and sauté a minute more. Add the salt, Chinese five spice, acorn squash and pear and cook for another minute, stirring often. Add the vegetable broth. Cover and bring to a boil. Once boiling, set the heat to medium-low to simmer for about 20 minutes, or until the squash is tender. Puree half the soup by transferring half the soup to a food processor or blender and then back into the rest of the soup. Add the adzuki beans and lime. Cover and simmer on low, just until the beans are heated through. While the soup is heating, prepare the mushrooms. Preheat a heavy bottomed skillet over medium high heat. Add the oils and sauté the mushrooms for about 7 minutes, until they are soft. Add the soy sauce and stir constantly until the soy sauce is absorbed (about 1 minute). 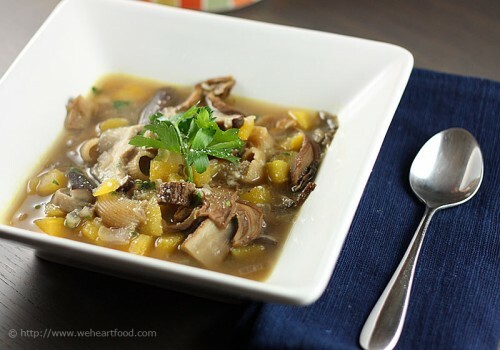 This soup, adapted from this recipe, was great on a cold evening: a variety of mushrooms, a bit of pasta, and chunks of acorn squash swim in a delicious, rich, mushroom-y broth. A very simple recipe with a fantastic result — it’s definitely going into our keepers list. Holy — this is one of the best broths we’ve had in a long time. Yeah, it has a really strong mushroom flavor from soaking the dried porcinis. I’m totally going to make this again; next time I’m also going to add carrots. Pour 1 cup hot stock over mushrooms in a small bowl; let sit 20 minutes. Strain through a coffee filter or paper towel. Add mushroom broth to stock. Rinse mushrooms and dice; set aside. Add squash to stock in a large pot with bay leaf and bring to a boil; lower heat and continue simmering. Meanwhile, heat oil in a large skillet over medium heat. Sauté onions 5 to 8 minutes, until soft. Add mushrooms and sauté until soft and lightly browned, about 10 minutes, adding a little broth if they become too dry. Transfer to broth along with pasta. 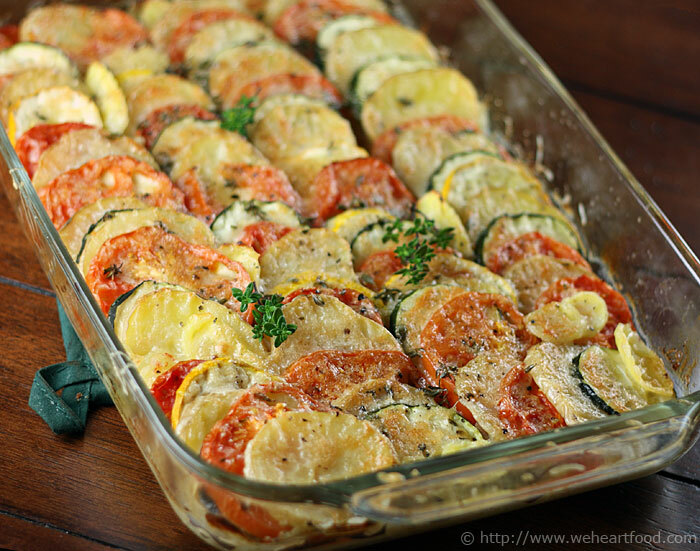 Cook 5 to 8 minutes, until pasta is cooked and squash is tender. Season to taste with salt and pepper and stir in parsley. Ladle soup into bowls and top with Parmesan. Lisa wanted to make dinner tonight, and we had a ton of vegetables to use up from our CSA box, so we came up with these vegetarian enchiladas, filled with summer squash, spinach, and mushrooms, and topped with a green chile enchilada sauce. Photogenic? Not so much. Healthy, full of veggies, and quick? Absolutely! How come all the food I make is ugly? Hey! All the food you make isn’t ugly; and I think the biggest reason this one isn’t exactly photogenic is because of the blue tortillas. Hmm… maybe… I love that enchilada sauce, it’s got a really nice flavor. I like the creaminess from the creme fraiche. 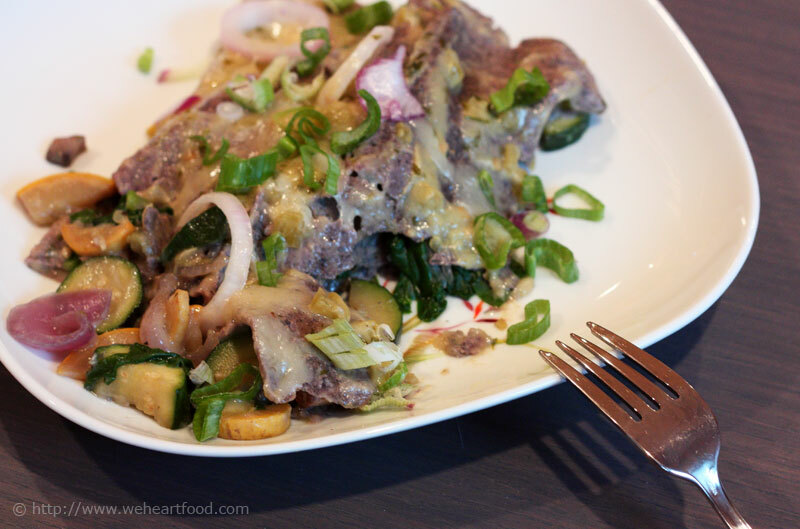 The filling is awesome — I don’t miss not having meat in there. Totally — and I like using up all our CSA veggies from the fridge. I can’t wait to have ugly but delicious leftovers tomorrow. Heat 1 tbsp olive oil in a large skillet over medium-high heat. Add the summer squash and mushrooms; cook for a couple of minutes until the mushrooms start to brown. Add the garlic, about three quarters of the red onion and continue cooking until the onions turn translucent and the squash is crisp-tender. Add the spinach and red salad onion stems, stirring constantly, until the spinach is wilted. Season with a teaspoon of salt, and cover to keep warm. In a small pot, heat the enchilada sauce to boiling, then lower the heat. Stir in cilantro and the creme fraiche into the sauce. Taste and season with salt, if desired. Hold a tortilla by one edge and dip into the sauce. Fill the center with 2 heaping tablespoons of the filling, then roll and lay seam side down in a 9×13 baking dish. Repeat with the remaining tortillas. Sprinkle with shredded cheese and remaining red onion, and bake for 5-10 minutes, until cheese is melted. Garnish with additional salad onions. 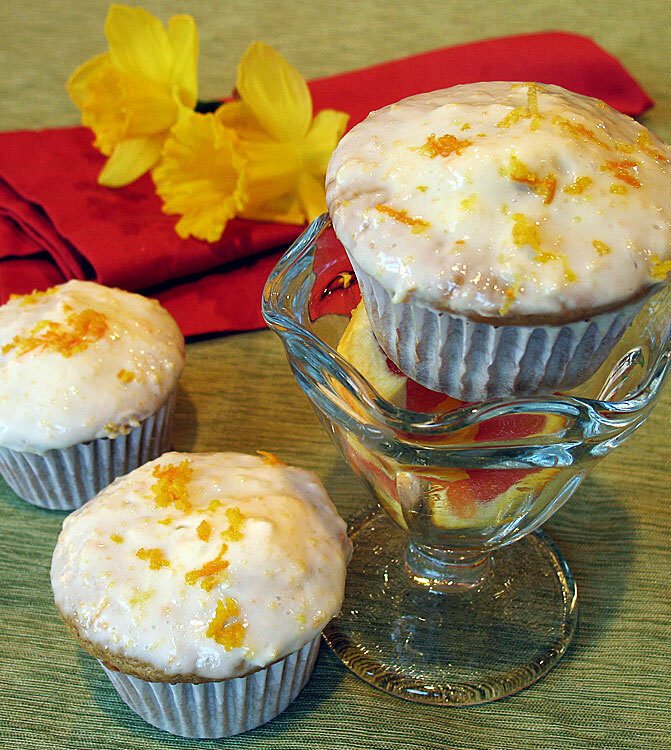 Lisa made these muffins adapted from a recipe found in Jamie Oliver’s cookbook, Jamie At Home. She cut the oil way down from the recipe, and nixed the walnuts (Whole Foods apparently didn’t stick them in the bag), but they turned out pretty darn good just the same. “With a Frosty Top”? What a random name… why can’t they just be called Butternut Squash Muffins? ‘Cause he’s a Brit… I hear they talk funny. Besides, it’s not like a traditional frosting… it’s a bit… goopier. It’s almost as if you should dip each one in the frosting just before you eat it. Well with all the extra frosting we ended up with, that’s exactly what I’m doing. I love that citrus taste! Okay, if these stay in the house any longer they’ll migrate directly from the kitchen into my mouth. Looks like the folks at work are getting muffins tomorrow! Preheat the oven to 350F. In a food processor, pulse the butternut squash until finely chopped. Add the sugar and eggs. Add in a pinch of salt, the flour, baking powder, cinnamon, olive oil, and applesauce and mix until well beaten. Scrape the sides if needed, and mix only until everything is well combined. Fill a regular sized muffin tin lined with paper cups until each cup is just over 3/4 full. Cook 20 – 25 minutes until a wooden toothpick inserted in the center of a muffin comes out clean. Allow muffins to cool on a wire rack. For the topping: Place the zest and lemon juice in a bowl. Add the yogurt, the sifted powdered sugar and vanilla and mix well. Taste, and adjust the sweet and sour accordingly. Keep in the fridge until ready to top the muffins. Sprinkle the topped muffins with a little more orange zest.